Long before Antarctica became frozen tundra, it was a lot more like the coast of Northern California, according to two studies published this week. Appearing in the Proceedings of the National Academy of Science, the studies help researchers understand the actual age of the ice and former climate of the continent. The first examines fossil shells collected from a small island off the coast of Antarctica. The shells have been linked to the Eocene epoch, a period 40-50 million years ago. By measuring the amounts of carbon-13 and oxygen-18 in the shells, the researchers determined that the temperatures were as high as 63 degrees Fahrenheit in some parts of the continent. They averaged about 57 degrees Fa hrenheit. The water in that area of the Pacific Ocean was around 72 degrees -- the same as coastal Florida's waters today. Understanding how the Antarctic climate has changed helps the scientists understand the potential impacts of rising global temperatures. "Quantifying past temperatures helps us understand the sensitivity of the climate system to greenhouse gases, and especially the amplification of global warming in polar regions," co-author Hagit Affek said in a press release. "This study gives us a clearer perspective of just how warm Antarctica was when the Earth's atmosphere contained much more CO2 than it does today," added lead author Peter M.J. Douglas. "We now know that it was warm across the continent, but also that some parts were considerably warmer than others. This provides strong evidence that global warming is especially pronounced close to the Earth's poles." 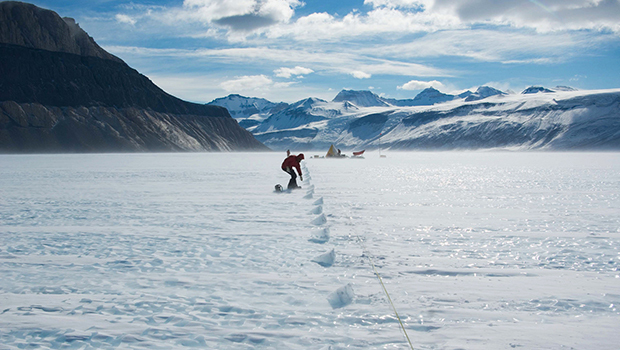 The second study established a new method for determining the age of Antarctic ice. The researchers measured radioactive krypton atoms in ice core samples from the Taylor Glacier, determining that they are 120,000 years old. The authors said the sampling method can now be used to find older samples. "The oldest ice found in drilled cores is around 800,000 years old, and with this new technique we think we can look in other regions and successfully date polar ice back as far as 1.5 million years," co-author Christo Buizert said in a press release. "That is very exciting, because a lot of interesting things happened with the earth's climate prior to 800,000 years ago that we currently cannot study in the ice-core record." The method has not been used extensively because it is incredibly difficult to isolate radioactive krypton-81 atoms from the air bubbles within the ice, according to the authors. Buizert's team overcame the challenge with the help of new drilling tools and the ATTA-3 atom counter. Having the tools to find and date older samples could reveal interesting finds. "There are places where meteorites originating from Mars have been pushed out by glaciers and collect at the margins," said Brook. "Some have been on Earth for a million years or more, so the ice in these spots may be that old as well." President Trump says White House officials should not answer questions from Congress about the Mueller report. Also, newly released body camera video shows a police officer shooting at a couple who appear to be unarmed in a car in Connecticut. All that and all that matters in today's Eye Opener. Your world in 90 seconds. Get the Eye Opener delivered straight to your inbox.